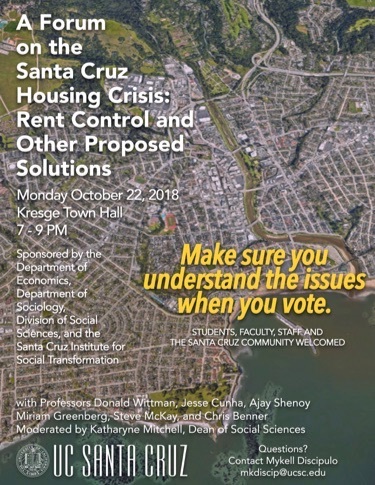 Six UC Santa Cruz scholars will discuss rent control and other proposals to address the Santa Cruz housing crisis during a free public forum on Monday, October 22, in the Kresge Town Hall. The event will run from 7-9 p.m. The discussion will be moderated by Katharyne Mitchell, dean of the Division of Social Sciences at UCSC, which is cosponsoring the event, "A Forum on the Santa Cruz Housing Crisis: Rent Control and Other Proposed Solutions," with the departments of Economics and Sociology, as well as the Santa Cruz Institute for Social Transformation. "Everyone agrees that the cost of housing in Santa Cruz County is out of control, and the impacts on residents are dire," said Mitchell. "But there is less agreement about what should be done. This forum will focus on rent control and other proposed solutions, with a range of positions represented by panelists. We want to help ensure that voters understand the issues and are well-informed when they vote in November."